Note: In order to apply new or changed constraints, you will need to regenerate/reallocate your schedule (click 'retry allocation' or 'erase games' and then 'generate schedule'). Team constraints are negative constraints – i.e. you're telling the scheduler what not to do. e.g. you can say do not schedule Honey Badgers on Saturday before 2pm; or do not schedule Neon Ninjaz at the Field 2 after 10pm. Generally speaking you want to keep your constraints as simple as possible. e.g. if you're looking to keep a team from playing on Fridays, simply select the team and Friday and click save, leaving all other fields as their default values. You don't have to select all the fields and put in from 6pm to 10pm for instance. In fact, if you did that and then added another time slot at 5pm, the team might get scheduled there. The same applies to blocking a field for a team in general or blocking a time period, e.g. never schedule this team after 9pm. If a constraint applies to multiple teams, you currently need to create a separate one for each team. If you select multiple teams, you will create a Coach Constraint, meaning those teams will not be scheduled at the same time (presumably because they share the same coach). Note: In order to apply new or changed constraints, you will need to regenerate/reallocate your schedule. Division constraints are positive constraints – i.e. you're telling the scheduler for Division 1, only do this. on Fridays, only schedule at Field 1, and only from 6-8pm. Again, you want to only enter what's needed. For the first example (only use Field 1), you only want to select the division and Field 1 and click save. A common mistake with constraints is combining too many things in one constraint. E.g. 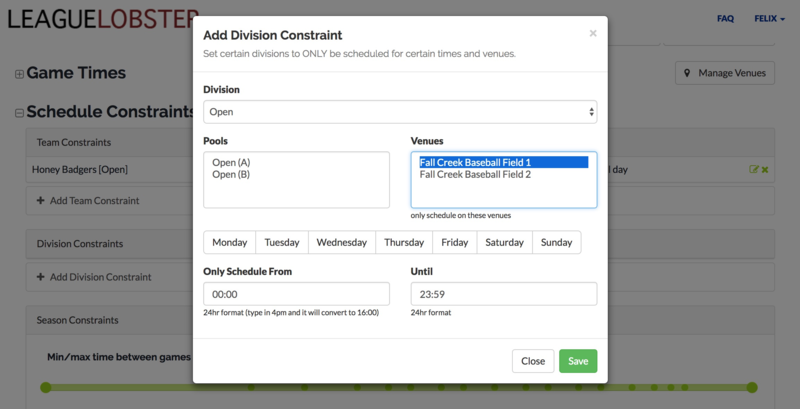 if you want to schedule a division ONLY FRIDAY and at a certain time/venue, you'll want to create one constraint that says ONLY FRIDAY, and a separate constraint for the time/venue. If you put FRIDAY, 6pm-8pm, Field 1, that tells the scheduler 'on the other days, do what you want'. You can also apply a constraint only to a specific pool(s) within a division – just select the pool(s) instead of (or in addition to) the division. This lets you set a minimum cool-down or rest period between each team's games – if they have multiple games within a day/week – or a maximum wait time – to avoid having teams sitting around for hours on end (mostly useful for tournaments). Adjust the minimum by moving the left side of the slider, and the maximum by moving the right side of the slider. A maximum of up to 18 hours applies only to games within the same day, i.e. a game 24 hours later would pass this constraint – it's meant to limit wait time between games within the same day. If you set the maximum above 18 hours, it will apply to games across multiple days, e.g. 20 hours max would mean, if a team finished their last game today at 12pm, their next game would need to start by 8am tomorrow (within 20 hours). If you put the maximum at 0 minutes (or something small), prepare for the schedule generation to end up with some unscheduled games – the constraint is enforced strictly, so if it isn't possible to create a schedule with strictly the maximum wait time you specify, you will get unscheduled games. Try being a little more generous (at least 1 or 2 time slots' worth) and regenerating your schedule. Note: in league schedules, these constraints do not apply across weeks, i.e. setting a max of 7 days does not ensure that each team plays every week. In fact, the league scheduler treats weeks as entirely isolated and does not move games between weeks. 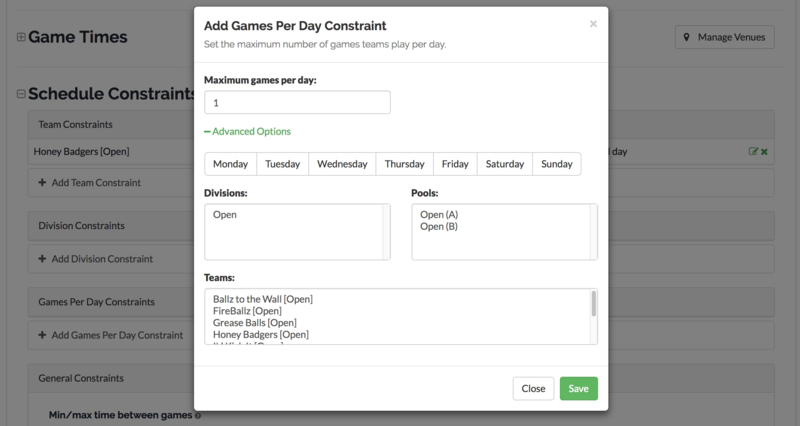 With the max games per day constraint, you can set a limit on how many games a team can play in a day.